Incremental, multiplanar reduction for distal radius fractures. Following fracture reduction, the Wrist Lock feature allows the surgeon to place the wrist into an extended position to help prevent finger stiffness and carpal tunnel syndrome. How do I learn how to use the Agee WristJack? Click here to watch our surgical technique video that not only shows the proper application of the WristJack, but also discusses the principles of treatment when fixing any distal radius fracture. You can obtain the full DVD by mail through our request info page. A detailed Surgeon’s Manual is included inside every WristJack sold or can be downloaded from this website. How does the WristJack work? First length is restored to the radius by using the RED worm gear adjustment. Moving to the GREEN adjustment, the hand is palmarly translated on the forearm. As the dorsal soft tissues tighten, they first bring the distal fragment(s) into opposition with the shaft of the radius. With further palmar translation of the hand, the articular surface tilts back towards normal. Further correction of the fracture anatomy can be “dialed in” using the other incremental adjustments. How does the WristJack restore palmar tilt without using wrist flexion? Longitudinal traction alone is usually not able to restore volar tilt to the distal radius unless combined with advanced degrees of wrist flexion. When extreme wrist flexion is used to maintain palmar tilt, it predisposes the patient to carpal tunnel syndrome and finger stiffness. The WristJack avoids wrist flexion and instead uses palmar translation of the hand. Restoration of length to the radius tightens the dorsal soft tissue hinge. The hand is then palmarly translated on the forearm. This palmar translation transmits a rotatory force from the hand through the carpus to the distal fragment(s) of the radius and tilts the articular surface back towards normal. Is the WristJack easy to use? 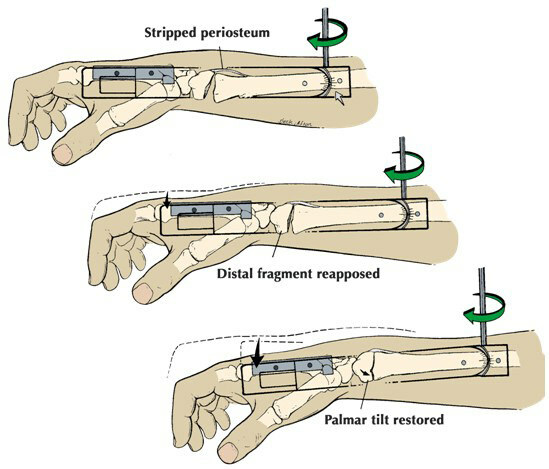 The unique biomechanical design of the WristJack complements the fracture patterns of a dorsally displaced distal radius fracture. The device is installed on pins placed in the hand and forearm after gentle manipulation obtains gross alignment of the fracture. Reduction is then accomplished through selective incremental adjustment of the gear mechanisms. Changing the alignment in one plane does not jeopardize previously obtained reductions in the other planes. Incremental adjustment mechanisms drive the fragments in orthogonal planes making it easy to understand the effects of each adjustment. Pin locations minimize soft tissue injury and maximize fracture reducibility. In addition, post-operative adjustments and removal can be done in the office setting. Is the WristJack single use only? Yes. It is sold as a single use, STERILE kit. However, there is a remanufacture program for the device that can substantially reduce costs. Following use, return the WristJack and instruments to Hand Biomechanics Lab. The complete remanufacture of the device involves disassembly, cleaning, parts replacement, reassemble and testing to the same standards of a new WristJack. After this takes place, all the parts are repackaged and returned to you. By taking part in the program, you can reduce costs by as much as 40 percent, while still maintaining the excellent product quality you have come to expect from Hand Biomechanics Lab. A new WristJack can be remanufactured twice, giving you a total of three patient uses. Is the WristJack X-ray translucent? Yes, please see X-rays below that illustrate this point. 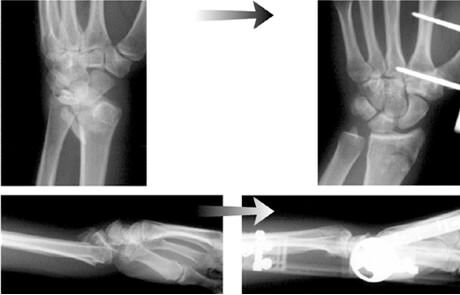 Note the X-rays show that the wrist and fracture site are not over-distracted and yet fracture reduction is maintained. Follow-up X-rays need to be taken a week after surgery to reassess fracture reduction, including distraction and palmar translation forces. The WristJack weighs only 8 ounces, including the pins. Does the WristJack have related products? There is a Quick Chuck and an Office Removal Kit available for use with the device. Both are available free of charge by calling 888-WRISTJACK. What billing codes are used with the WristJack?